In this year the T8 company has created a furor at the «Svyaz-Expocomm» exhibition. T8 LLC using its exhibition stand has for the first time demonstrated two Russian records at once: the 100 Gbit/s signal transmission for 2,000 km in an 80-channel DWDM system and the 100 Gbit/s signal transmission for 400 km via a single span without intermediate stations using the ROPA technology! The demonstration of these achievements has become possible due to creation of the first Russian aggregating transponder named ATP-100-10. The aggregating transponder with a channel speed of 100 Gbit/s has been fully developed, assembled and tested by the Т8 Company. The new transponder has been developed using modern modulation and decoding methods called DP-QPSK. The transponder has the best signal quality parameters in the world: the required OSNR=12.5 dB. This event has really gone globally and became the one of the key events of the exhibition. During the exhibition Т8 employees have conducted many negotiations with current and potential clients, and also have met company partners. The visitors’ attention, besides the main Russian record, has been attracted by the compact CWDM system named IRTYSH, which has been developed for organizing Russian city and area networks, by the distributed security fiber-optic system called DUNAI. And of course the main event was the visit of I.O. Schegolev, the Minister of Telecom & Mass Communications in Russian Federation, and N.S. Marder, the Deputy of the Minister of Telecom & Mass Communications. The main products of T8 have been demonstrated to them and all functions and values of the equipment have been minutely explained. 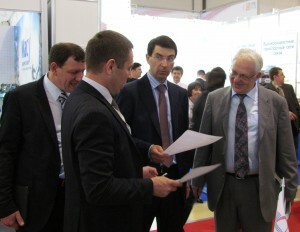 Moreover, the company’s stand has been visited by technical directors of Rostelecom, Transtelecom, MTS, Vympelcom and other.